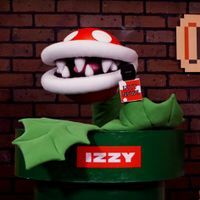 Izzy is a Piranha Plant who is served as the co-host of The Play Nintendo Show along with Andrew Trego. Izzy has two leaves, which served as arms and has a comic relief. Izzy supports him throughout the show with segments including "Andrew & Izzy's Top 5". Before lunch, Izzy gets a bit snappy. This page was last edited on March 15, 2018, at 18:10.